A warm mug of hot chocolate is a tasty treat after spending time outdoors in cold or snowy weather, but you may interested to learn that this beverage can also be a source of key nutrients. Depending on how you prepare your hot chocolate, you may be benefiting your body with essential vitamins and minerals. Learn the differences between preparation methods so you can prepare yourself the most nutritious mug of hot chocolate possible. An 8-oz. mug of hot chocolate prepared at home with milk contains 192 calories. 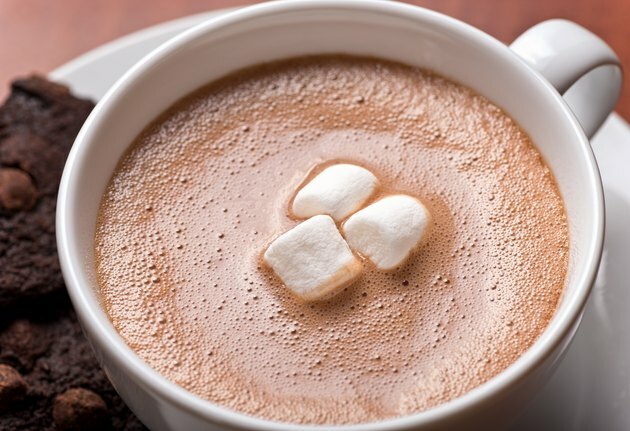 If you use a packet of hot chocolate powder with marshmallows using water, your beverage contains 152 calories. If you opt for a mug of hot chocolate, you may want to stick with just one because it might contain more fat than you think. Diets high in fat may cause you to gain weight and may also put you in danger of developing heart disease and high cholesterol. An 8-oz. serving of homemade hot chocolate contains 5.85 g of total fat, with 3.57 of that being saturated. Prepare an envelope of hot chocolate powder with water and your beverage contains 1.52 g of fat, with less than 1 g being saturated. Hot chocolate, no matter how you prepare it, has a large amount of sugar. If you regularly consume large amounts of added sugar from your food and beverages, you may be at an elevated risk for tooth decay. A high-sugar diet may also increase your chances of having high triglycerides and gaining an unhealthy amount of weight. An 8-oz. serving of homemade hot chocolate prepared with milk contains 24.15 g of sugar. One envelope of hot chocolate powder made with water contains 24.8 g of sugar. If you make your hot chocolate at home, you will get a hefty dose of iron from your beverage. If you do not have enough iron in your diet, you may experience fatigue and a lowered immunity. An 8-oz. mug of homemade hot chocolate with milk contains 1.05 mg of the 8 to 18 mg of iron you need each day. Powdered hot chocolate does not contain a significant amount of iron, particularly when it is prepared using water. If you use an envelope of hot chocolate powder, you will only be getting trace amounts of any vitamins and minerals. Make your hot chocolate homemade with milk, and you will get a significant dose of certain nutrients. An 8-oz. mug of homemade hot chocolate contains 2.5 g of fiber, 285 mg of calcium, 1.57 mg of zinc, 262 mg of phosphorus, 492 mg of potassium and 440 IU of vitamin A. Your beverage also contains 110 mg of sodium.